Air/Water & Foam Extinguishers There are 3 products. 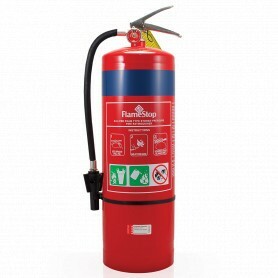 FlameStop proudly stocks its own Water Stored Pressure extinguisher, AFFF (Aqueous Film Forming Foam) extinguisher and ECO Foam F3 (Fluorine Free Foam) extinguisher. 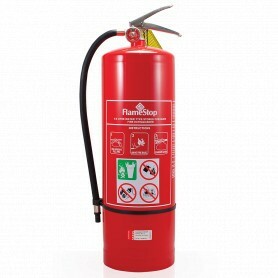 These three extinguishers are available in 9kg stainless steel cylinders and handles with high UV resistant powder coating. FlameStop’s water stored pressure extinguishers are commonly used in other areas such as storage for dried goods, wood, paper, plastics etc. The valve and ferrules are constructed from brass. FlameStop’s superior AFFF (Aqueous Film Forming Foam) extinguishers are well suited to tackle liquid fires such as oil based fuels, paints and solvents. The valve and ferrules on the AFFF extinguishers are also constructed from brass. 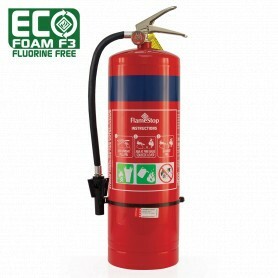 FlameStop’s Eco Foam F3 is free from the highly persistent organic pollutants PFOS (perfluorooctane sulfonate) and PFOA (perfluorooctanoic acid), while maintaining a strong level of firefighting ability. The valve is constructed from brass.